We have previously met early Brisbane businessman William Perry, the founder of the huge Perry Bros hardware emporium. Perry lived at Folkestone, a hilltop residence at Bowen Hills. William Perry left his mark in this suburb too - Perry Park, where the family grazed their livestock, and Folkestone St are reminders of this entrepreneur. 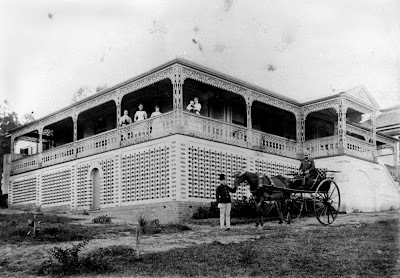 The house Folkestone no longer exists - after William Perry's death, the land was sold to the Catholic church, and on the site of the house Archbishop James Duhig built Our Lady of Victories church. Perry was also a family man. 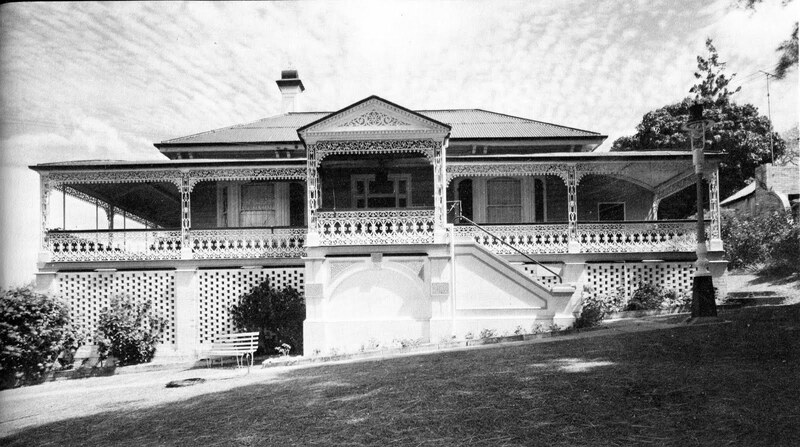 On his estate at Bowen Hills around the year 1885, he had this residence, Miegunyah (pictured below), constructed for his sons Herbert and George. I have been enjoying reading your blog. I am a member of the QWHA & it is lovely to see your nice photo of Miegunyah. The result is a fine book by Beth Wilson of Wilson Architects called Brisbane Houses with Gardens. The book covers the Brisbane area from pre-settlement through to today and would be very interesting to anyone who enjoys the history of our region.